If you’re keeping up with the news, you’d know that the Rail Tram and Bus Union (RTBU) is in dispute with both the tram and train operators. At this stage, there is a threat of industrial action, which could be anything from refusing to wear uniforms to refusing to check tickets to disrupting services for several hours, or even longer. Obviously if services are stopped, even outside peak hour, this will cause a lot of disruption for passengers, who will have to defer their trips or find alternative methods of getting around. Stay informed. It’ll help a lot of you know when (and if) any service disruptions are occurring. Be aware particularly that if the RTBU says there’s a four hour (10am-2pm) shutdown of trains, this probably means services begin winding down just after 9am, and won’t be back to normal until 3pm or later. 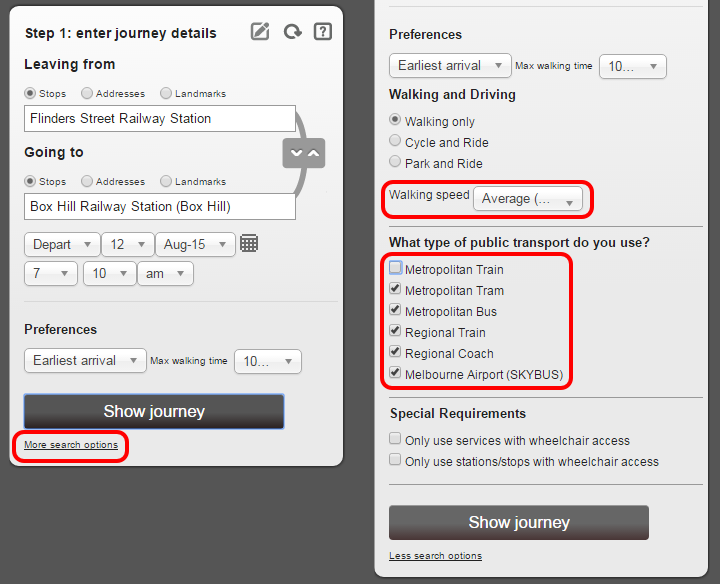 Check how your trip is affected before you find yourself waiting on a station platform. Plan your trip. If you have to travel at a time of disruption, plan ahead. If you can walk/cycle/drive to another service, that might work. This is useful for everyday use as well. The walking speed is something I always tweak, as the default is quite slow. Some people going to the airport like to switch off the Skybus option to avoid the premium fare. Always carefully check the results; the PTV web sites and app don’t show a map, so be sure it’s worked out precisely where you’re going correctly. And of course one should be cautious in the context of a big train or tram disruption, as during a strike there’s likely to be delays to street-based public transport due to increased traffic. This is problematic when relying on buses in particular — a missed connection could easily mean a 30 minute wait. In my testing on a trip from the Flinders Street Station to Box Hill Station, the default told me a train would take 23-27 minutes. Switching off trains recommended a tram instead, taking 58-64 minutes. Switching off trams as well worked out a bus trip, catching 2-3 buses and taking 67-80 minutes. Slow, but at least it is possible. But at least in many cases there are options. At this stage it’s unclear if V/Line services will keep running if Metro is disrupted. The shut down has been confirmed for Friday week — remember, services disruptions will be wider than just those four hours. Update 21/8/2015: the Friday tram and train stoppages were called off, but there is now the threat of a tram stoppage next Thursday. Just glad PT strikes have been very rare since mid-1990s. If the proposed rail strike next Monday doesn’t affect peak (sort of) then it will be a bonus. Helpful information, Daniel. Thank you. Good hints. In the advanced search, Stefi also recommended tweaking the maximum walking time from the default 10 minutes. You’d want to check the routes though. For me, it insists that the best route is to catch a bus through the southern edge of North Melbourne to Footsray, and then a second bus back to the northern edge of North Melbourne. Given the congestion, I’d suspect it would be better to get off at North Melbourne and walk! Err, just read much of what you said at The Age online. S’pose it is a compliment. They have to source their info from somewhere. My other tip – and I know several people doing this already – is, if your business around and about can be rescheduled or deferred or reconfigured, do that. (ie if you have a job where it is possible to work at home for a day). This clearly won’t work for everyone, but it can for many people. Yeah, deferring (or bringing forward) travel is definitely the best option where possible. 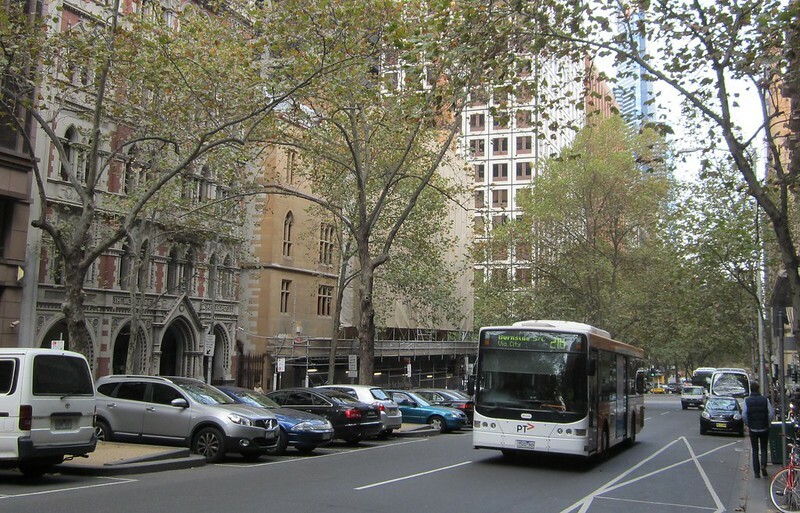 I still remember going into the city in the 90s and seeing all the trams parked in Collins St. I did not live in Melbourne at the time. Did not work as they got rid of the conductors any way. This post might need an update: both strikes for Friday 21 Aug have been called off, but there’s still the possibility of a tram strike on Thursday next week 27 Aug, according to http://www.theage.com.au/victoria/trams-to-run-on-friday-as-rail-tram-and-bus-union-cancels-strike-action-20150819-gj33gf.html (The Age). @Travelling Tim, to answer your earlier question, pretty much the info I’ve heard is what’s in the media.